Dear 11 year old me, you're going through some confidence issues right now and you've done the right thing with your parents by seeking out the right help. Three years prior, you was eight years old, you had nearly all your adult teeth but you started getting pains in your gums. An appointment at the dentist confirmed your teeth wasn't growing correctly, and you'd need braces to sort everything out. You was excited, you was going through that stage of wanting braces, you didn't care about the embarrassment some people feel, you thought they was cool and you hoped to be getting train tracks so you could change the colours regularly. You waited for an orthodontist appointment and that soon arrived, you was really excited and went along to the appointment with your mum. You wasn't even sat down in that orthodontist's chair for two minutes when without warning she stabbed your gum with a needle, something that's scared you since birth, and something you're still scared of now in the future at the age of 25. You jumped off of that chair, ran towards the door, opened it and ran out into the car park, your mum soon followed and pleaded with you to come back in, but you didn't, and you never went back to the appointment they re-booked for you, you refused point blank, no matter what you was bribed with. Now at the age of 25, you class this to be one of your biggest life regrets, you don't have many, but refusing to get your teeth sorted is something that upsets you on a daily basis. It affects your confidence so much, you don't even like smiling to the man who proposed to you, the man you now call your fiance (yep, you got engaged to a gorgeous charming young man, and you've got a child too, you had him at the age of 15 and he's just perfect!). Your child is the only person you smile at, without covering your mouth with a hand, your child is the only person you've smiled with whilst taking photographs, though you don't have the confidence to show them photo's off, and it makes you upset when you think about important days in his life like his graduation, getting married and making you a grandmother. You also worry about your own wedding, you don't want to be a unhappy bride, but you know you don't have the confidence to smile with the teeth that you hide. You wish to win some big money, because then you could afford dental implants and to get married! Right now, you're struggling to afford to get your eyebrows waxed, let alone save for a wedding and dental treatment. 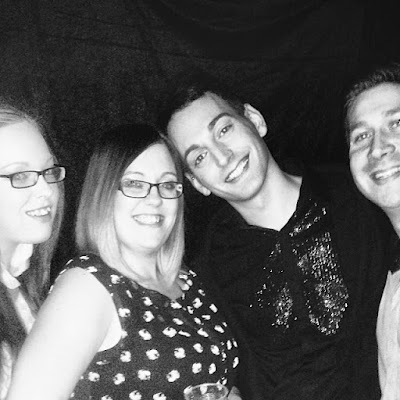 I tried to find a photo of you and your teeth from the future, but sadly I could only find one, the photograph is taken with your older sister (who now has two children), your second eldest brother and his partner (yes he finally come out as gay, we all knew he was! ), you're smiling, off guard, you was propositioned by the person taking the photo to smile, and for one split second you did so, and at that very instance, they caught you. Usually you would pout, or smile with your mouth closed, and then refuse to want to see the photo anywhere because of how awful you look. You position yourself to be at the end of photo's, so you can easily be cropped out without upsetting anyone else by cropping them out. So I'm writing to you from your future, to tell you to please go back to the follow up appointment booked in for you, because your confidence will only get worse, and besides, you go on to have a baby in life, so needles are something you're soon get use to! You'll never like them, but your soon learn they're quick and easily over with! Oh and you have a tattoo when you turn 16, so you can't be that scared! Love from your older self, 14 years into the future!